Manager Peter Murphy continues to build his squad for the forthcoming season with another addition in James Creaney. Full back James Creaney joins the Black and Golds after featuring as a trialist over the weekend. 28 year old Creaney started his youth career at Kilmarnock before joining Ayr United. 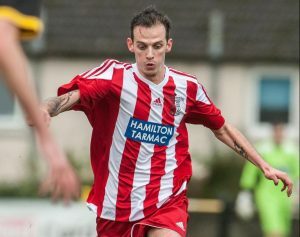 The bulk of his professional appearances have came at Stranraer and Dumbarton where he helped “The Sons” achieve promotion to the first division. He has more recently played at Stirling Albion and spent 6 months at Cowdenbeath last season.